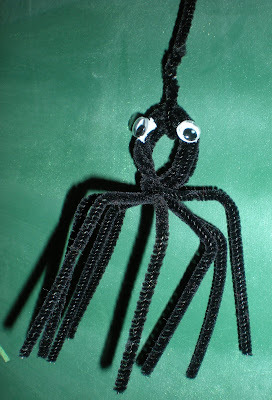 The other day during my lunch break I came up with this very simple, but cute spider. You can make lots in many different colors to decorate the house. 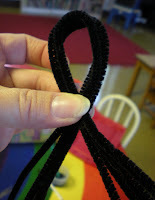 Take 4 pipecleaners of any color, I used black, and gather them together. Fold all 4 pipecleaners in half. 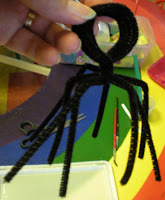 Now make a loop at the fold, and then twist the pipecleaners to leave the loop at the top. 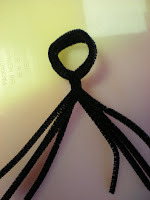 Take the eight pieces hanging below the loop and shape them into legs. Finally add two drops of tacky on the lop sides and glue on some wiggle eyes. 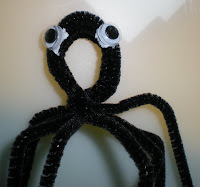 I took one more pipecleaner and twisted it around the top of the loop so that I could hang it. I think these directions sound complicated, but it really isn't. These can be put together pretty quickly. Have fun. I LOOOOVE that!! it is so dang cute!!! LLLLLOVE it! I'm hoping we can dig in next week and do some final Halloween projects since we basically lost all of this week. My girls love pipe cleaners. Very simple and cute. Make and Takes blog had an idea for a spider visor- black visor with piper cleaners coming out sides and google eyes on top. Gotta love simple, but fun. How perfect for the little ones! Thanks so much, I'll be linking.